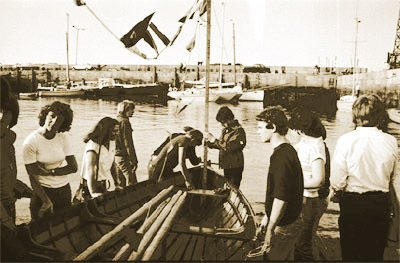 Skiff rowing in Dún Laoghaire, in common with other East Coast Rowing Clubs, is passed on to us from the hobblers of old. The hobbler men rowed fishing and pilot boats in Dún Laoghaire Harbour and all around the east coast. They rowed much bigger and heavier boats than the present day skiff. However, the tradition has been passed on from these hobblers of the 18th and 19th centuries to rowing clubs up and down the east coast of Ireland. The tradition is honoured today through the many skiff regattas along the coast during the summer months. In the early 1900s the hobblers of Dún Laoghaire Harbour and elsewhere along the coast were starting to decline as a result of steam and motor engines. However they would still race each other out to a coming ship to pilot her ashore. Whoever got there first got the job. They also had races among themselves at the end of the week for sport. Often the winners of these races would get more work during the coming week as a result of their efforts. In the early 1920s many of these hobblers and ex-hobblers held a meeting in the Workman’s Club in Dún Laoghaire and formed St. Michael’s Rowing Club. The exact date and year of the foundation remains unknown. Indeed in the next few years two more clubs were formed in Dún Laoghaire Harbour; “British Rail” and “Board of Works”. These along with their counterparts in Wicklow, Ringsend, and Dalkey etc. held events along the east coast. At this time St. Michael’s were training from the harbour where we remain to the present day. All of this continued up to the 2nd World War when rowing was to stop in Dún Laoghaire and along the east coast. 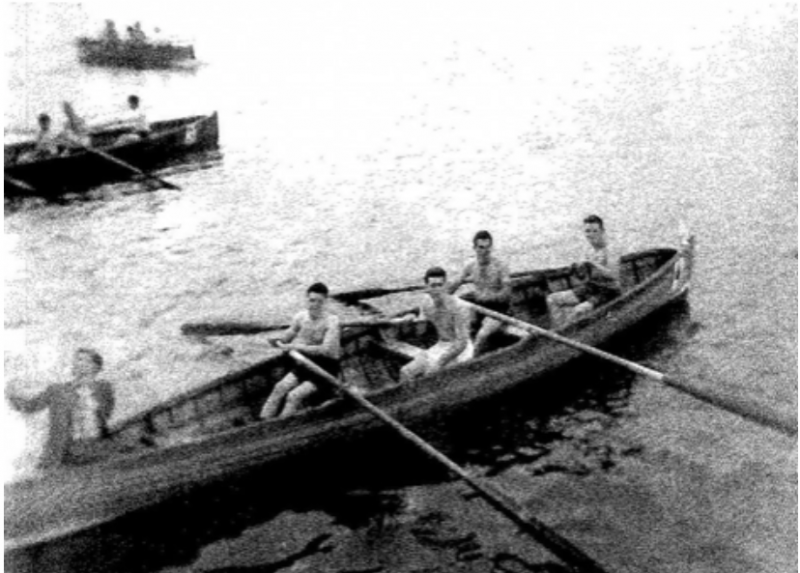 After the war, around the early 1950s St. Michael’s Rowing Club was revived by a dedicated few. Along with their friends from up and down the Coast the sport of skiff racing was revived. In 1970, the East Coast Rowing Council was formed. This body was given the task of formalising the rules, organising regatta dates and judging any disputes. Rules were laid down as to sizes and weights of skiffs to make races fairer. In the pre-war years St. Michael’s Rowing Club was a great winner of all races it entered.